Two Vegetables in One… or Brussels What??? Two Vegetables in One….or Brussels What??? 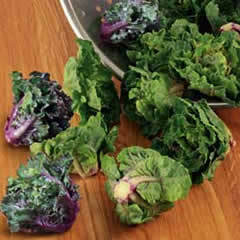 Flower Sprouts ‘Petit Posy’ are a newly invented vegetable that’s an enticing cross of two nutritional powerhouses. Bred in England from Brussels sprouts and all colors of curly kale, ‘Petit Posy’ was unveiled only a couple of months ago in the organic produce department of Waitrose, the United Kingdom’s big natural foods retailer, where it’s been a hit with shoppers in the U.K.
And now you can grow this brand new vegetable in your own garden, where it’s sure to be a talking point. The question…..is ‘Petit Posy’ a leafy green or a sprout? The flavor and nutritional content is similar to that of spring greens, yet the plant has the same unusual growing pattern as Brussels sprouts, standing up in the garden through the winter. Frilly-edged ‘buttons’ or ‘rosettes’ grow on long stalks, looking surprisingly girly for a tough, hardy vegetable. The leaves are appealingly purple, green and bi-colored, making these tasty little vegetables appealingly ornamental in the garden and on the table. It’s easy to pick the loose little rosettes off the stalks, then steam, microwave, roast or toss them into stir fries for nutritious greens (a good source of Vitamins A,C,K and folate) through the winter. So I guess you’d have to say ‘Petit Posy’ offers the best attributes of both parents – the curly edges, nutrition and varied colors of kale, the unusual growing pattern and bud-like shape of Brussels sprouts. I haven’t yet had a description of the taste besides “delicious”…. So stay tuned. In the meantime, plant ‘Petit Posy’ in spring and early summer for October through February harvests; Log House Plants will begin shipping starts to nurseries on May 1st. Harvested in a colander, ‘Petit Posy’ Flower Sprouts look like miniature kale; growing in the garden they bring to mind tiny Brussels sprouts tarted up for a party.